This summer marks the eighth time that Matt and I have spent a week of our summer canoe camping in the Boundary Waters. Tucked in a remote corner of Minnesota’s great north woods, it’s one of our favorite places to travel when we want to get away from it all and one of the Midwest’s best-kept secrets. Matt was introduced to this area almost twenty years ago when a college friend of his organized a ten-day trip for him and their buddies. As you might have guessed, it was love at first paddle for Matt, and what’s not to love? The Boundary Waters Canoe Wilderness Area (BWCWA) is located on the border of northeastern Minnesota and Canada’s Quetico National Park. It is the land of 10,000 lakes, and canoe is the primary mode of transport, taking the notion of slow travel to a whole new level. This vast wilderness is so pristine that it is still possible to drink water straight from the lake without needing to purify it. 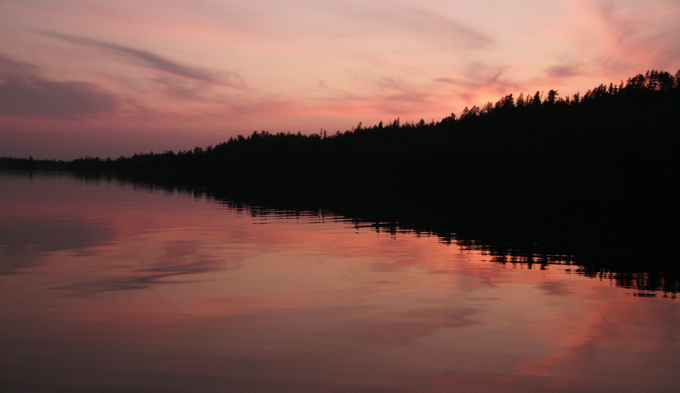 The Boundary Waters is nature at its best—subtle, serene, life-affirming and ultimately rejuvenating. Here, you are more likely to encounter majestic eagles, playful otters and industrious beavers than you are other people. Every lake in canoe country seems to have a pair of resident loons, and evenings on island campsites are marked by the haunting wails and tremolos of these striking birds. If Matt had his way, we might just spend the entire summer in the Boundary Waters. But the poor fellow is married to me, so he has to settle for a week or so after returning from our international travels. This is always the last week before Matt heads back to school, and the Boundary Waters makes for the perfect spot to relax and unwind after an intense summer of international travel. A place has to be pretty spectacular for us to want to keep going back year after year, and on that front the Boundary Waters consistently delivers. After spending so many years going there, we have come to think of her as a reliable old friend. No matter how long we’ve been apart, she always welcomes us back with open arms, and we pick up right from where we left off. Within minutes of pushing off from that first shore, putting a paddle in the water and saying goodbye to civilization, we are back in familiar company. All our cares slip away as our old friend helps ease our end-of-summer, back-to-school blues with one last week of outdoor adventure in the backcountry. The Boundary Waters does have its share of flaws (annoying bugs including deer flies, no-see-ums and mosquitos large enough to don a saddle just to name a few), but its amazing qualities more than make up for it and earn it a place dear to our hearts. Our next series of posts will highlight our adventures on this year’s trip to the Boundary Waters. We hope you enjoy a little peek into our version of paradise! 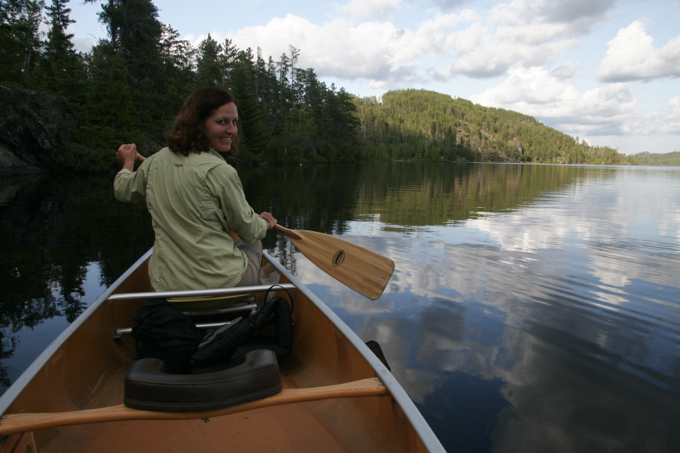 I grew up in northern Wisconsin (and later the Twin Cities) and often went to Boundary Waters. It’s a beautiful area! I now go up to the Maine Wilderness that in some ways reminds me of this spot. Looking forward to reading your other post on it. Very cool! Where are you from in Wisconsin? Matt grew up in Stevens Point. We are always looking for new places to paddle. Where do you go in Maine? I had a few friends who went to college in Stevens Point! I grew up in Hayward, WI which is another great place to visit (any time of year). I now live outside of Boston and am a member of the Appalachian Mountain Club so stay in their cabins in Greenville, Maine. That sounds wonderful. Lucky you to have such great amenities so relatively close. Can’t wait for the next installment and I am VERY envious of everything except the saddled mosquitoes, no see ums and deer flies. Thanks, Rick! I never knew that you were a canoeist! Our friend, Chris, had a bug shirt that he brought on our trips. I envied it for many years and finally bought one this past year. We plan to do a post on some of our favorite items for the Boundary Waters backcountry, so we’ll get you more details then. Thank you for reading! Thanks for allowing me to reminisce! I spent a summer (and a January) at a camp on Seagull Lake. The wildlife, sunsets/rises, and general vividness are unparalleled. As are the skeeters. I hope to get back there some day! Thanks so much for visiting. The pleasure is all ours. We’ve never been to the Boundary Waters in the winter but have looked into the idea of taking one of the multi-day dogsledding trips available. Is that what you did? I bet that there are no skeeters then! Brings back awesome memories. I can’t wait to return and make more! At least a few times a year I find myself spending an entire evening looking up Ely’s news and checking out the Piragis catalog, I hope to make it back soon! I have not seen or spoken to you in years, I hope you’ve been well- it sure looks like you have! During the summer of 1973, after graduating from high school, two friends and I took off on a car trip throughout the states west of the Mississippi River. We didn’t make it specifically to Boundary Waters, but we did Minneapolis to Duluth to International Falls. Absolutely beautiful! We would love to see more of Minnesota. We really only know this little corner of the state, and it’s spectacular. I’m sure there is a lot more to see! To Drive or Be Driven? That Is the Safari Question!